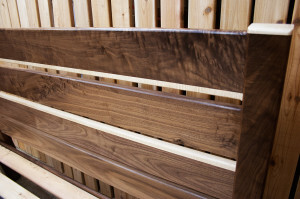 I recently finished the most involved, high-end bed frame to date, made of walnut with curly maple accents and a matching walnut/curly maple headboard. The customer wanted it to be extra extra nice, so that’s what he got. Little details like routing a round profile on each edge of every slat, gluing the headboard post caps and long rail end caps on without using pin nails (which was an adventure in clamping), and making the waxed shellac finish on every exposed surface glass-smooth really made this frame stand out. Take at look in the walnut section of the hardwood frames page to see photos of the frame that really don’t do it justice. Note the heavy figure in the walnut on the foot rail and a fair amount of it also in the headboard. It’s rare to get walnut with that kind of “curly” look!